Video featuring the first true commercial actuator in action on an eight entrance/exit commercial property in California. Video featuring the latest Maximum Controls brushless DC gate operators; superior components at a competitive price. Powerful, super quiet and made in the USA. True continuous duty cycle at extreme temperature ranges. The ability to move massive gates, twice as heavy as your competition in the brutal summer heat. See the Max 1500, Max F18 sliding gate operator, Phantom F6 super fast 6 second to 90 degree swing gate operator. Features include: Adaptive ERD, Brushless DC motor with 5 year warranty, 6 million cycle motor, partial open and anti-tailgating, plus, see our Aeromax Long Range Wireless Intercom; up to 4,000 ft.
Home Show Radio video features an older model gate operator replaced with a Max Megatron 2200. 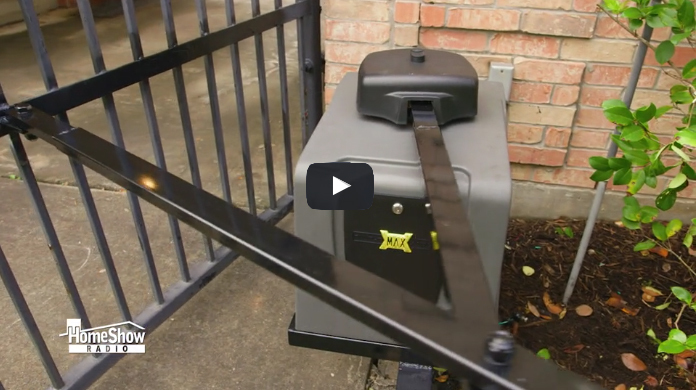 The video promotes five ways to avoid gate operator damages or injuries; an easy task when using a Maximum Controls gate operator.